1. HA-414 is our new design and development for air conditioner remote control. Notice: Model CP10C10 Serial Numbers Earlier Than LFMK00001 Must Use 67307701-AKB73016005 No Display. Serial Number LFMK000001 AND LATER Must Use 67307703-6711A20103P With Display. Notice: Model CP12C10 Serial Numbers Earlier Than LFEK00333 Must Use 67307701-AKB73016005 No Display. Serial Number LFEK00333 AND LATER Must Use 67307703-6711A20103P With Display. 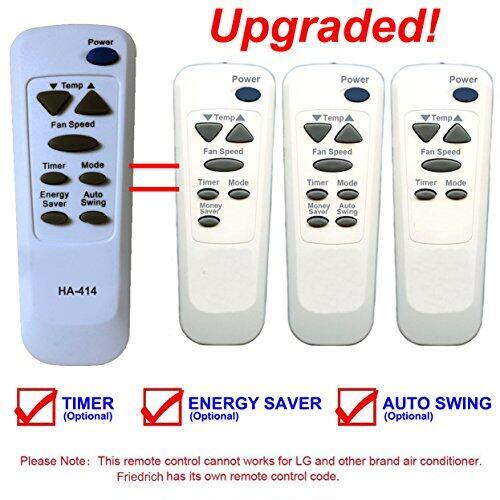 This remote control cannot works for LG and other brands air conditioner, as Friedrich has its own remote code. Please note: This replacement has Friedrich basic functions: POWER/ TEMP/ FAN SPEED/ TIMER(Optional)/ MODE/ ENERGY SAVER(Optional)/ AUTO SWING(Optional). The optional functions are only available when your air conditioner has these functions.